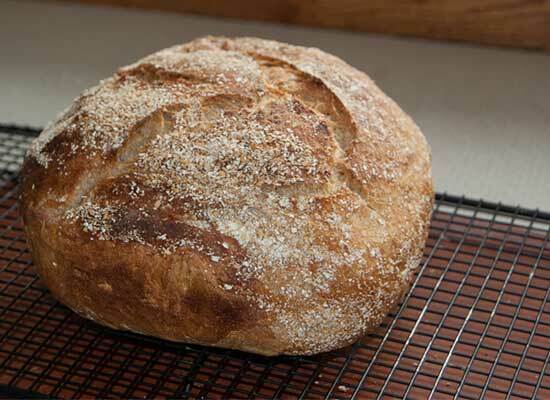 Just to review what we’ve done so far: Thursday we fed the sourdough. Total time: 5 minutes. 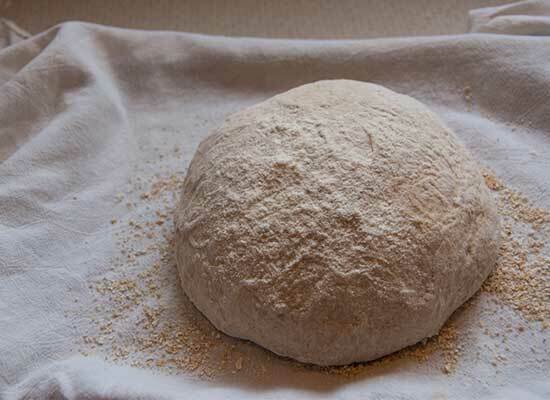 Friday we made the dough. Total time: 10 minutes. Now it’s Saturday and we’re going to bake. You have to organize your time for baking day. There is no way to phone it in. I sometimes realize that I will be gone in the afternoon and then scramble to get the baking done before I go. 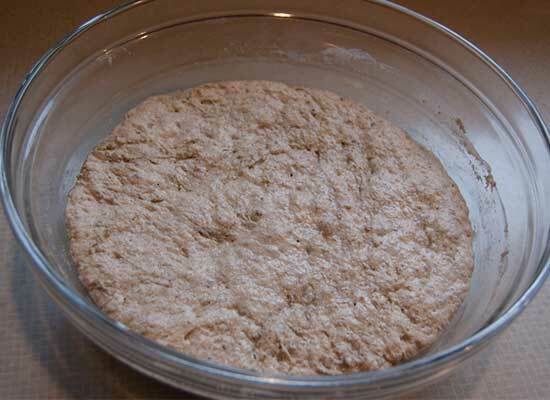 Here is the bread dough after 18+ hours. All bubbly. This is the only scary part if you’re not a regular bread baker. It can be very sticky. I put a bunch of flour on the counter and my hands and scrape the dough onto the counter. I re-flour my hands as necessary. I pat the dough out into flat circle. Not like pizza flat. More like the size of a dinner plate. Fold in half and then fold in half again, tucking the folds underneath and trying to make the top smooth. Just do your best. Cover with the plastic wrap and let it rest for 15 minutes. After 15 minutes, I do the same thing: pat into a circle, fold, fold and form into a ball. I have my towel from earlier and spread on sheet pan. I sprinkle a handful of oat bran the towel. Totally optional. I like the way it looks on the finished loaf. I put my ball on it, sprinkle flour on the top and cover with more towel. You want the flour and/or bran to keep the towel from sticking. Then put in a warm-ish place and set a timer for 75 minutes. 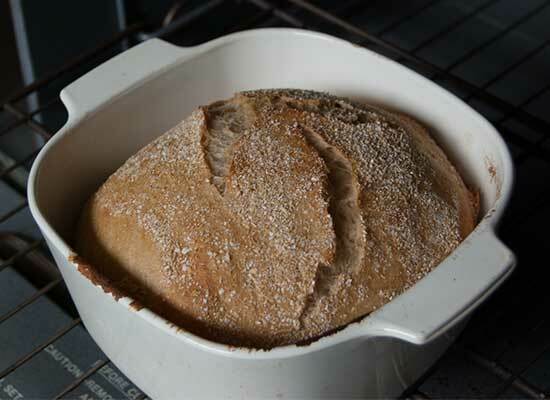 The no knead bread recipe calls for baking in a Dutch oven. 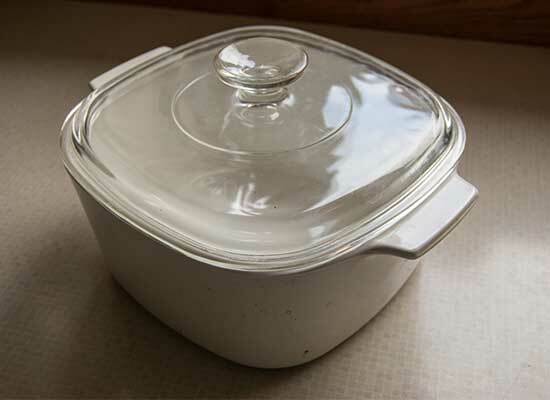 I did not have a Dutch oven when I started making this recipe and I tried out this pyrex instead. I have since acquired a Dutch oven but I still like the results better when I use this. Set your oven for 475-ish and put the pyrex or Dutch oven in there. Set your timer for 15 minutes. When your timer goes off your oven and baking container should be heated and you are ready for business. Now you have to figure out how to get your dough from its towel to the cooking instrument. Good luck! I pull out the oven rack and remove the lid. Don’t space out and forget that the lid has been pre-heating in the oven. Pot holder. 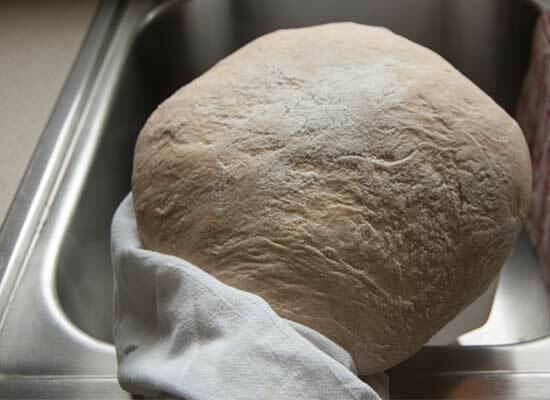 I pick up my bread ball in its towel in one hand and shake out the towel with the excess oat bran over the sink because I am fussy that way. Then I gently overhand it into the pan. Hopefully your pan isn’t sliding around or off the rack. Caution here. You can see it doesn’t look pretty. Also note that now the oat bran is on the top. 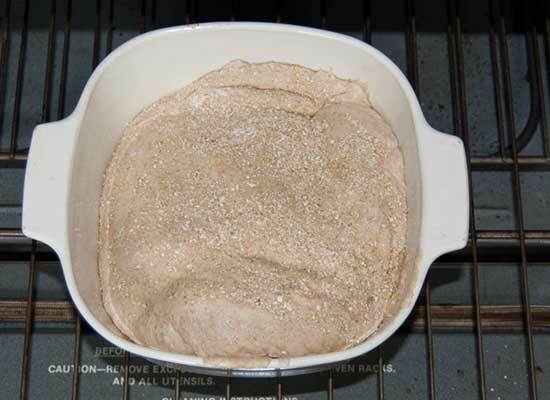 I shake the pyrex if the dough needs settling, replace the lid and shut the oven. Set the timer for 25 minutes. Here’s where you need to get to know your oven. The actual baking time for step 1 is 30 minutes. I have an electric oven with a mind of its own but generally runs hot (except when it doesn’t …). When we buy an oven we’re going gas but until then, this is what I’ve got. At about 25-30 minutes it should be puffed up and pale. Remove the lid, turn the oven to 450 and set your timer for 12 minutes. Actual baking time is 15 minutes. I use a Thermapen to check the bread. You’re aiming for 210 degrees. At this point mine is almost always around 207 and I call it good. Finished loaf, beautiful! It lasts all week but is especially delicious the day of baking. We have hunks with dinner and Bob carves it up to make sandwiches for his lunch. This entry was posted in cooking, doing it wrong and tagged I made this. Bookmark the permalink.